Ahead of his latest UN statehood bid, PA Chairman Mahmoud Abbas tells Israeli television that he will never allow a third intifada. Ahead of his latest unilateral statehood bid at the United Nations, Palestinian Authority Chairman Mahmoud Abbas is claiming that he will never allow a third intifada. "As long as I'm sitting here, in this position, I will not allow an intifada. We will act only through diplomatic and peaceful means,” he said in the interview which was held Thursday in his Ramallah headquarters. 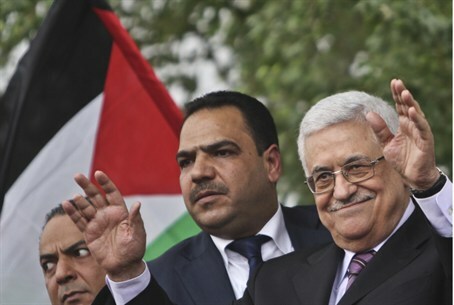 "I'm ready to return to negotiations," said Abbas, repeating claims he recently made in conversations with EU representatives, and calling on Israel to bring back the peace negotiations to the agenda ahead of the upcoming elections. "This issue will determine the fate of your children, I am the last person with whom you can reach an agreement,” he claimed. Abbas claimed that, despite being originally from the city of Tzfat (Safed), he is not thinking for one moment of going back there. "For me Palestine is a state within the pre-1967 borders which exists alongside Israel,” he said. At the same time, he insisted on going to the UN and asking the General Assembly to recognize ‘Palestine’ and give it ‘super-observer’ status. Abbas has constantly imposed preconditions on peace talks with Israel, demanding that Israel accept the indefensible pre-1967 lines as final borders, release all Arab terrorists from its jails, and halt construction in Judea, Samaria and east Jerusalem before talks begin. At the same time, he has refused to recognize Israel’s right to exist. In a concession to Abbas’ demands, Israel imposed a nine-month freeze on Jewish construction in 2010. Abbas, however, rejected returning to talks because, he said at the time, the freeze did not extend to all of Jerusalem. On Wednesday, his chief negotiator claimed that a freeze on Jewish construction in Judea and Samaria was an Israeli obligation, not a condition set by the PA.
"We are not placing any conditions on the resumption of negotiations," Saeb Erekat said after French President Francois Hollande called for a resumption of peace talks without preconditions between Israel and the PA.
"Prime Minister Benjamin Netanyahu and President Francois Hollande both know perfectly well that a settlement freeze is not a Palestinian condition but an Israeli commitment," Erekat added. "The recognition of [the State of Palestine at the UN] will not free the ground the next day, but it will prove our just cause that our land is occupied and not disputed territory, and this is true in regards to all of the territories Israel occupied before June 1967," he wrote. The PA's public opinion that all land prior to 1967 is now "occupied territory" is nothing new. Last Independence Day PA officials spoke on television, saying, "Today, 64 years ago, the Israeli Zionist gangs committed the broadest deportation actions against our people in the occupied lands in 48." Educational programs for children on PA TV ask children, "You live in Jerusalem. Did you go to the cities occupied among cities in 1948", and when the child says "I visited Hebron", the host presses, "No, Hebron is a city [Palestinian Authority] we can all get into. Occupied cities - such as Lod, Ramle, Haifa, Jaffa, Acre - Have you visited them?" Palestinian Authority newspapers commonly refer to certain officials as "leaders of the Palestinian territories occupied in 1948." PA media, sponsored by Abbas, also constantly glorifies terrorists that have murdered hundreds of innocent Israeli civilians. The full interview with Abbas will air on Channel 2’s Friday evening news magazine, and the network promised it will contain what it said are "surprising statements" regarding Prime Minister Binyamin Netanyahu, Foreign Minister Avigdor Lieberman, and the ongoing terror rocket fire from Gaza.